Michael's Plumbing Supply is known for their quality Bathroom products, service, design and innovation. 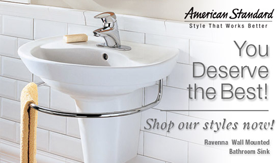 We Specialize in products for Bathroom remodeling and replacement using name brand manufacturers such as Kohler, Moen, Price Pfister, American Standard, and Elkay sinks. When it comes to fixtures for Bathroom improvement you can select sinks in porcelain, stone, glass and composite materials.